Saturn's Moon Tethys glides past in its orbit. Image credit: NASA/JPL/SSI. The majesty of Saturn overwhelms in this image from Cassini. 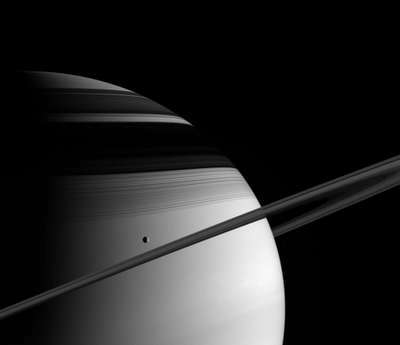 Saturn's Moon Tethys glides past in its orbit, and the icy rings mask the frigid northern latitudes with their shadows. Tethys is 1,071 kilometers (665 miles) across. The imaging team is based at the Space Science Institute, Boulder, Colo.